But of course a Staryk king would want a queen who really could make gold out of silver, mortal or not. The Staryk always came for gold. When I was a child, I imagined that unicorns lived in the woods behind my grandparents’ house in the mountains of Asheville and that fairies made little mushroom houses in the tall grass. I imagined all their magic could be shared with good little girls like me (smirk) if only I believed hard enough and if I was nice to wild animals. I even wanted to grow wings like a fairy! Then I watched movies like The Last Unicorn, Legend, and The Dark Crystal and I realized that the world of fantasy can be a dark and scary place. Of course I was afraid. But I had learned to fear other things more: being despised, whittled down one small piece of myself at a time, smirked at and taken advantage of. 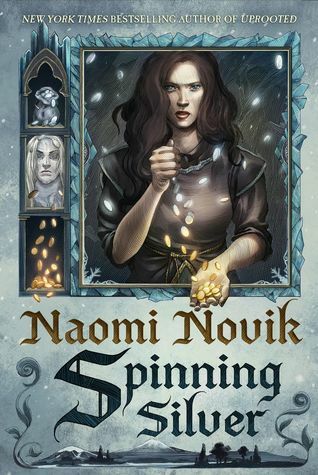 In Naomi Novik’s second fairy tale retelling (The first is Uprooted, a reimagining of Beauty and the Beast), the author puts a new spin on the classic tale of Rumpelstiltskin in a very original way. Originally this story has nothing to do with rainbows or pixies – none of the niceties of fairyland. The Brothers Grimm told a tale of a greedy miller who pawned his daughter off to an equally greedy king with the promise that she could spin silver thread into gold – something that she really had no clue how to do. The king locks her inside three progressively larger storage rooms filled with straw and threatens her life unless she is able to spin the straw into gold by morning. Each night she is rescued by a vertically-challenged, opportunistic man who collects her jewelry as payment for performing the task. The final night, she’s out of baubles, so she barters away her first-born child in exchange for the little man’s spinning services in order to save her own life. Years later, her first born child is born and little dude comes to collect his due. She is only given a reprieve when he tells her that if she can guess his name in three days, then he will let her keep her child. After two days of incorrect guesses, one of her servants overhears the little man singing a song bragging about his impending dinner to be made of the queen’s child and in the song he lets slip his name. The servant drops the dime on the little man to the queen, and she fronts him out in front of the whole court with his name: Rumpelstiltskin! <cheers, claps, bowing, curtseying, thank you, thank you>. You were challenged beyond the bounds of what could be done, and found a path to make it true. So that was how the Brothers Grimm framed their story. Naomi Novik kept a lot of the symbolism of the original tale, but her reimagining takes a totally different spin. See what I did there? MIRYEM – The daughter of a Jewish moneylender who realizes that she is better at the job than her dad is. Maybe too good. Suddenly she’s swept up in the icy cold world of the Staryk (think Game of Thrones White Walker) changing silver coins into pure gold. With her life always under threat, Miryem has to balance protecting herself and her beloved family back home in a town so small it doesn’t even have a true name. WANDA – The daughter of an abusive town drunk, Wanda becomes responsible for her two brothers and her own survival during a harsh winter. Her strength of character and some old-fashioned good luck propel her into an uncertain destiny, but one that she embraces more than the cruelty of the life she once knew. Seriously, the development of this character is so endearing – she can’t be overlooked as one of the book’s true champions. IRINA – The daughter of a duke who is only interested in increasing his household in money and in position. And if he can use Irina to do that, then all the better. But when he gives her in marriage to the demon-possessed tsar, Irina has to do more than learn how to rule and protect a kingdom; she has to learn to save her own life. These are the three heroines of the story, but there are other characters that contribute heavily to the story and make these women successful. And then there are the bad guys who are indeed bad, but they have a reason. Or a motive. Or a defense. You decide. Either way, I love to hate them, and then I hate to love them. But I had not known that I was strong enough to do any of those things until they were over and I had done them. I had to do the work first, not knowing. Spinning Silver is one of those books that I really wanted to read the moment it was released; however, due to a clump of NetGalley ARCS that released in July and August, I wasn’t able to get to it until now. It became available at my local library, so I snatched it up and finally read it in three days. And now that I’ve read it, I wish I could have slowed it down and savored it more. I love the classic fairy tales, but often retellings can be hit or miss. This one is a hit. Although it is a reimagining of the classic Rumpelstiltskin, it earns its own identity – building a unique world with strong characters and more than one terrifying antihero. Things I love: The originality built into a story that we thought we knew; the multiple POVs; the internal strength of the heroines that seems to come from genuine heart, not trumped up attitude; the fact that there is no clear right and wrong action for the characters to be goaded into by the reader; that sometimes even the enemies surprise you. This book is worth a re-read (in the future when my TBR list no longer resembles a literal mountain) and it has made me add Novik’s Uprooted to that pile in hopes of finding another 5-star read. 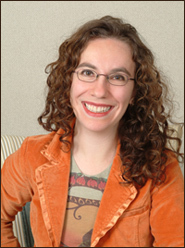 Naomi Novik was born in New York in 1973, a first-generation American, and raised on Polish fairy tales, Baba Yaga, and Tolkien. She studied English Literature at Brown University and did graduate work in Computer Science at Columbia University before leaving to participate in the design and development of the computer game Neverwinter Nights: Shadows of Undrentide. Her first novel, His Majesty’s Dragon, was published in 2006 along with Throne of Jade and Black Powder War, and has been translated into 23 languages. She has won the John W. Campbell Award for Best New Writer, the Compton Crook Award for Best First Novel, and the Locus Award for Best First Novel. The fourth volume of the Temeraire series, Empire of Ivory, published in September 2007, was a New York Times bestseller, and was followed by bestsellers Victory of Eagles and Tongues of Serpents. I’m glad to hear you enjoyed Spinning Silver as its making me more excited with every positive review I read! I took your advice and put Uprooted on reserve at the library. Hopefully I won’t have to wait too long!